Gardening How To’s – Container Gardening | Warner Companies, Inc. So here’s a puzzle – what do you do if you want the benefits of a beautiful garden but don’t have the space? Or you have space, but the terrain isn’t particularly conducive to a traditional garden, with challenging soil or steep slopes? Living in an apartment or having a hilly land doesn’t mean you can’t enjoy beautiful blooms or healthy home-grown veggies. 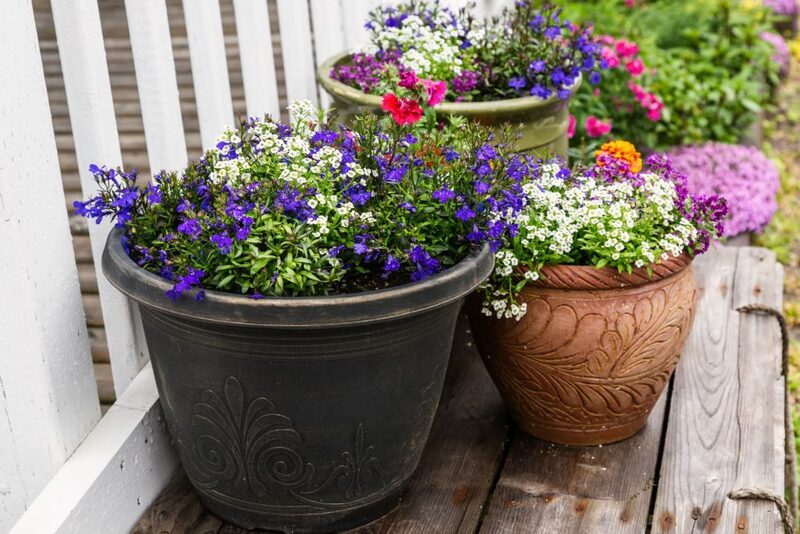 You can create your own horticultural haven with container gardening. Plus, container gardening gives you one more aesthetic tool when creating your garden – the container itself. Warner’s Nursery has a phenomenal collection of pots, hanging planters and windowsill brackets in a variety of sizes and colors to suit your personal taste and your plants’ needs. Good Drainage – Make sure the container you choose has a hole or holes big enough for excess water to escape. And if it is a pot that you plan on placing on a flat surface, you might want to elevate it so the water isn’t blocked. Good soil – You will be creating your plants’ environment and key to that is good, healthy soil and a slow-release fertilizer so your plants don’t starve. We have an excellent array of soil and fertilizers at Warner’s and we’ll be happy to discuss what will work best for your container garden. Careful transplanting – When you are removing your plant from the nursery container, please be gentle. If it’s in one of our multi-packs, you can squeeze the flexible plastic to ease the plant out. If in a nursery pot, try pushing it out from the bottom. Try to avoid pulling the plant out. Also, if the plant is root bound, you might need to remove the excess root coming out of the bottom holes – and remember to gently spread out the roots before placing the plant in its new container home. Air Pocket Perils – Beware of air pockets. If you have several plants in one container, make sure there’s enough soil between the plants to avoid air pockets. They are killers, causing the plant roots to dry out. Maintenance and watering – As we all know, gardening is almost as much art as it is science. Make sure you know the conditions your flowers, herbs and vegetables prefer and water accordingly. Typically “moist, not wet” is a good rule of thumb. Be particularly careful with your hanging plants. Some special notes for hanging plants – Make sure you hang them from a spot where they can be fully supported by the structure they are hanging from. And because they are suspended in the air, hanging plants are more susceptible to drying out, so you really want to make sure to replenish the moisture as soon as they get dry. Place your fingertips about an inch below the surface. If the soil feels dry, you need to water. And because you’ll be watering them more frequently, you’ll need to replenish your hanging plants nutrients with fertilizer more often. Following these steps, you should be able to enjoy lovely blooms and fabulous veggies in your stylish and convenient containers all season long! Remember, you can always ask our experts at Warner’s for tips and hints on container gardening or any of your gardening needs. We’d love to see you.